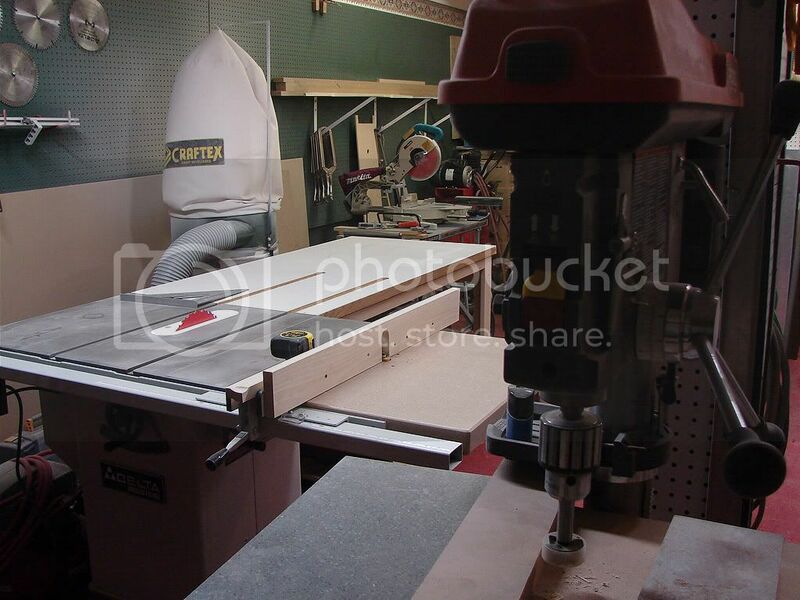 I am curious, if some one were to manufcture granite router table tops would you be interested in buying one? I am thinking that they would be the perfect material, so sag like MDF tops and no rust like cast iron tops. What do you think. I am just looking for some opinions or ideas. Seems like this was just raised no too long ago??? I have two thoughts, both tending towards the negative--cost would likely be moderately high and the material is brittle for the application. That is why Hanstone, Cambria, Silestone all would be better suited than granite...no brittleness there. Engineered stone would be a better choice.. aka quartz. There are plenty of slabs available, usually end-cuts and sink/cooktop cut-outs. The main reason eStone would be better, is that it holds a variety of fasteners better, and can be machined to thinner dimensions while staying very strong. That kind of material makes for great router table tops. On Feb 15, 3:53�pm, "Bonehenge (B A R R Y)"
Would 17 x 26, or sometimes 18 x 28 be a good size? They'd run from 55 - 70 pounds. Minus the cut-out for the router body. The body has to be brought up to a thinner spot than the customary 1.25" thickness. God forbid I'd tempt anybody to use a router-bit extender. Maybe a router plate would have to be used.. like a Lee Valley. An 18x28 would work for me, as my current 1-1/2" (2x3/4") MDF top is 20x30. My plate is a Rousseau, which has been fine for 5 years. The cutout for the plate has a 3/4" wide rabbet that the plate drops into. How do you cut and rout that stuff? On Feb 16, 8:33�am, "Bonehenge (B A R R Y)"
With a 10 HP spindle, diamonds, and lots of water. You'd lose a lot of accuracy with an extender. Steel City is offering table saws with granite tops. I've got a request in for a bit more information than the web site or press releases include, but it sounds interesting: I've been fighting rust, usually successfully, on table saw tops since I was 15, and I wouldn't mind a break, but I'm worried about fragility...my guess is, though, that if it makes it to your shop in one piece, and you get it set up, fragility is no longer a worry. And you have another place to rest coffee mugs. Just don't peen over any rivets on it. Sounds good to me, but you'd have to provide a fair bit of customization as people will probably want to use different lifts, plates, routers, etc. Doesn't really seem worth the effort. If the only advantage is rust and sag then I'd say no. If you are having a sag problem you can just build a torsion box or double up some 3/4 MDF and add a few cross braces. Also, the stone has disadvantages. I suppose the slot would wear after a while, so you need to figure how to mount a track anyway. If you want to add some custome fence, you won't have an easy time cutting a new slot or two. If you wnat to customize the router plate hol or add a hole and counter bore for a lift screw, not so easy. Not sure really how slick stone would be, even when polished. I would much prefer an easily replacable, cheap, slick, and customizable laminate top. Sounds like a solution looking for a problem. I don't foresee the need of a track. This top is slicker than anything else and flat. Wow, Your 3D skills are legendary. That is the best drawing you have done yet. The wall with the pegboard and sawblades are particularly realistic! Good job! I had to poke all those holes, with an awl, (DigitalAwl V 2.0) A lot of work. The blades were SAWZcad version 14 for UNIX. btw.. no comments on my skillls with BagCAD on the DC? Better a shaper, with a motor designed specifically for use with a thick top. That, or infill material for Spiers or Norris pattern bench planes. Green parrot's wing agate would be nifty looking, though costly -- assuming you actually care about cost. Note that unless wrung, really heavy, really flat block-shaped things tend to glide across each other as if floating on air. Corner cabinets without lazy susan. Can a granite counter top be "notched"? Silestone as Router Table Top? Just wondering if this would be good Idea!